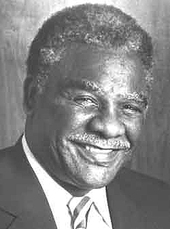 Last week's episode of NPR's This American Life was completely devoted to the story of Harold Washington, Chicago's first (and so far only) black mayor, first elected in 1983. Washington died just seven months into his second term, Nov. 25, 1987. Now, on the 20th anniversary of his death, This American Life takes a look at the struggles Washington overcame to get elected, as well as his impact on American politics of the past two decades -- including another certain black Chicagoan. It's a great episode of This American Life, and really interesting. You can listen to it for free.